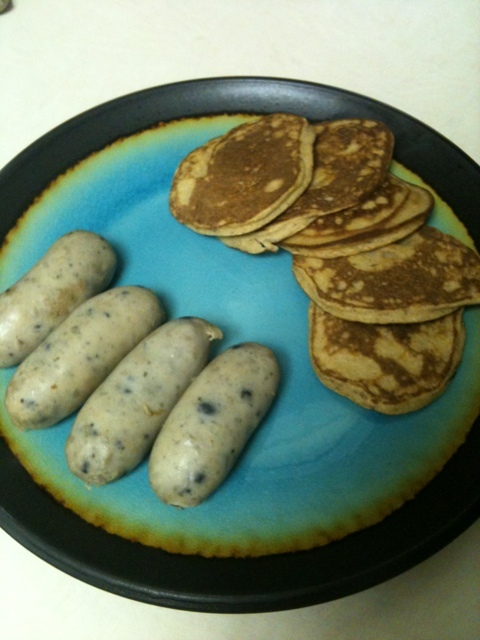 food: paleo pancakes | eat. drink. fly. monday is my sunday this week. meaning its all about pajamas and couch love and a big breakfast. and today, i had a hankering for pancakes. i’ve been getting more brave about the coconut flour cooking. and i came across a recipe that had great reviews for some coconut flour pancakes and figured i may as well give it a shot. like all my recipes, qualification number one was that i had everything on hand in my pantry or fridge. so here’s the recipe… i’m not going to type out how to make a pancake. if you can’t figure out how to make that go, then i’m not sure a recipe will help you in life. beat together eggs, milk, vanilla & syrup until frothy. the pancakes turned out quite lovely. great texture and light coconut taste to them… myself & the husband really enjoyed them. they’re definitely not an everyday food, but as a special treat every now and then, i give this recipe a gold star. How were the sausages? Did you get much of a blueberry or maple flavour to them? they were pretty maple-y and not really very berry-y.